Black Roots are one of my all time favourite UK reggae bands. Their sound is in the same great tradition as Aswad, Misty in Roots and Steel Pulse – heavy as lead bass lines, groove and clear melodies. And Black Roots were apparently part of the Bristol reggae scene, a music scene that is now put on wax by Bristol Archive Records. The Bristol Reggae Explosion 1978-1983 is according to the label the first and only attempt to document the local reggae scene from the late 70’s and early 80’s. According to Bristol Archive Records none of the tunes – except for the Black Roots tunes – have ever been reissued and this is their debut in digital format. It was certainly a long overdue deed. This is a historical document that includes great music and very informative liner notes about the Bristol reggae scene and the bands and artists that appear on the compilation. Roots reggae dominates the 14 tracks by eight bands and artists and there are several highlights here. Four Point Plan, by a band called Restriction that only released one four track twelve inch in 1983 mixed and engineered by Mad Professor at his Ariwa Studio in London, is a deejay lead masterpiece with some nice dub echoing going on. Black Roots and Talisman are represented by three tracks each; two of Talisman’s are live recordings. All six are classic UK roots with solid brass arrangements. Sharon Bengamin’s Mr Guy is lovers rock in the Janet Kay tradition and keeps things sweet and smooth. Today DJ Stryda of Dubkasm keeps the Bristol reggae flag flying high, and this compilation shows that he has a firm foundation to rely on. A new compilation from Bristol Archive Records celebrates the venerable history of the city’s reggae scene. Adam Burrows goes back to the roots. “We came from Jamaica at a young age,” remembers Jabulani Ngozi, the band’s rhythm guitarist. “We went through the school system in Bristol. We tried to get work, but work was not easy to get.” The band grew out of a soundsystem that played unlicensed ‘blues’ parties in St Pauls, and the community’s support was crucial. “Without it we would never have made our first single,” says Jabulani. ‘Bristol Rock’ was funded by proceeds from their first concert, attended by 1,200 local people. Black Roots applied reggae’s language of struggle to Thatcher’s Britain. “Everything was going against the mass of the people,” Jabulani says. “We wanted to rise up against all of that. The music was there to ease that depression away.” By 1981 they were playing to 2,500 people, supporting John Holt at Hammersmith Palais, and they went on to record 10 albums and numerous sessions for Radio 1 without ever signing a deal. “EMI had an interest in us at one time, but they wanted us to go a certain way. They wanted us to make the lyrics a little more conservative.” While their uncompromising attitude limited their success, it didn’t stop them becoming a live sensation. They played with everyone from Jamaican stars like Eek-A-Mouse and Toots & The Maytals to homegrown icons like Linton Kwesi Johnson. Their challengers for Bristol’s reggae crown were Talisman, a band from Easton. While both groups were big draws on the student circuit, they never played together, and there was a bit more to their relationship than professional rivalry. “It never came to fisticuffs, but there was definitely an extended vibes,” says Bekele, Talisman’s frontman. Archive Records’ Mike Darby has described ‘The Bristol Reggae Explosion’ as “a personal crusade to get Black Roots and Talisman on the same record”. By the late 80s, live reggae was in decline, and bands like Black Roots and Talisman began to wind down. The new digital dancehall style drew Jamaicans away, while Britain was transformed by a crumbling of cultural barriers. “Reggae defeated itself by infecting everything else,” says Martin Langford. “Hip-hop, house, jungle, garage… black youths had a new British identity, and they started creating music to reflect that.” Bristol’s music was particularly transformed by the rhythms and dynamics of reggae. As half of Smith & Mighty, Restriction’s guitarist Rob Smith went on to be an architect of the ‘Bristol Sound’, while Talisman have reportedly been cited as an influence by Massive Attack. 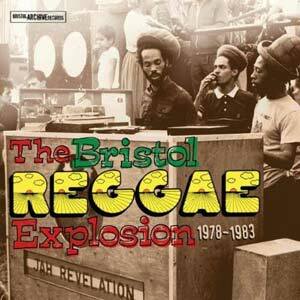 ‘THE BRISTOL REGGAE EXPLOSION 1978-1983’ IS RELEASED ON BRISTOL ARCHIVE RECORDS ON MON 21 FEB. SEE WWW.BRISTOLARCHIVERECORDS.COM FFI AND FOR MORE GREAT BRISTOL REGGAE, PICS, RECORD SLEEVES AND POSTERS.